The Vodafone Foundation is deploying its portable mobile network in the largest refugee camp in Southern Sudan, an overcrowded temporary settlement that lacks basic infrastructure. The network should enable aid workers in the Yida camp to better help its 70,000 inhabitants, as well as being used for free by refugees to contact relatives and to deliver education programmes to children living there. The Instant Network weighs 100kg, fits in three suitcases and takes just 40 minutes to put together. It has already been used to provide communications during extreme weather events in Kaikor, Northern Kenya and in Davao Oriental. The mission will also include an assessment of a larger permanent refugee camp to look at the potential for establishing an education centre for child refugees, where they will use tablets and smartphones to provide educational resources. This entry was posted in aid, education, Mobile Marketing Magazine, mobile network, refugees, sudan, vodafone on June 24, 2013 by kirstystyles1. Generation Wireless – Will women and unconnected majority lose out? Telefónica UK has released the results of the largest ever global survey of Generation Y Millennials, broadly seen as those aged 18 to 30 that have lived most of their lives with access to the internet. The mobile operator, owner of O2, spoke to more than 12,000 people across 27 countries in six regions. Given the tech focus of the report, it is clear that many see the global internet revolution as empowering, useful and necessary for future personal and global success. The research found that 76 per cent of this group now owns a smartphone, highest is in Asia thanks to hugely tech-savvy populations in Japan and South Korea, at 83 per cent, and lowest in Central and Eastern Europe at 60 per cent. Look to your left and right. No matter what your political leaning, and whether you think it is always a positive thing, it is clear that we are always-on, media gorgers. Much of what they found won’t come as a shock. In North America, Western Europe, Central and Eastern Europe and Asia, all of these young people agreed that the economy is the number one issue. In Latin America and the Middle East and Africa the answers differed – with social inequality and terrorism topping each list respectively. A significant majority, 63 per cent of Millennials globally, believe it is difficult for their generation to progress from school to adult life. With unemployment rates in many of the countries surveyed highest among 16 to 24s, this comes as little surprise. And news of the consequences of ageing populations has clearly reached our young people too – 39 per cent expect to have to continue to work indefinitely and not have enough money to retire. When asked whether they thought employment was a right or a privilege, 55 per cent said that having a decent job was the former versus 45 per cent who picked the latter. A bit of a leading question? It is an economic imperative – we all have to eat. More positively, and hopefully without delusion, 68 per cent of those surveyed believe that they have the opportunity to be an entrepreneur. Telefónica claims to have identified a new kind of elite – 11 per cent of Millennials globally – who are not defined by metrics like socioeconomic status, but by their access to technology and opportunity. While their immediate priorities are the same – family, school and friends come first – 44 per cent of these leaders believe access to technology is important to success, compared to 30 per cent overall. “These people are at the cutting edge of technology and highly interested in what happens around them from a political standpoint,” said José María Álvarez-Pallete, COO of Telefónica on launching the results. “Politicians around the world must see that technology is going to influence the future. But this is not just for government but for business leaders too,” he said. Speaking in a keynote at the launch, Julian Genachowski, former chairman of the US telecoms regulator the FFC and head of Obama’s tech strategy during the 2008 election, said that the world is now engaged in a “global bandwidth race”. As healthcare, tech, government and people move increasingly online, countries are now concerned with giving companies and citizens the quickest access. But given that only one in six of the world’s population actually has access to the internet, 1bn people, it is clear that socioeconomic status, which gives people access to technology and opportunity, is likely to still dictate who the winners will be. And while many young people are switched on, politically speaking, as Álvarez-Pallete mentioned, many aren’t. Recycling is the acceptable face of the green movement in developed nations but sustainability goes out the window when you see flights to Barcelona for £49. Meanwhile, literacy and access to basic human rights and services, let alone internet, are also hopelessly lacking in large parts of the world too. The UK’s young people appear to be are more tech savvy than their global counterparts, the survey found, with 49 per cent here saying they have an excellent knowledge of technology compared to just 30 per cent worldwide. Tech is now seen as more important than any other subject, with 25 per cent saying it is critical to future success, compared to economics and science both at 18 per cent or languages with just eight per cent. There are certainly jobs to be had in tech, in fact, there is a skills shortage. On top of that, 76 per cent believe technology makes it easier to get a job – many jobs are only advertised online – so job search, application and even doing many of your average Western jobs is an increasingly digital pursuit. A “new gender gap”, as if we need one, was also outlined by Álvarez-Pallete, with men around the world much more likely to consider themselves at the cutting edge of tech – 80 per cent vs 69 per cent. Those that believe that tech is the most important factor to ensuring future success also saw a contrast – 42 per cent vs 29 per cent. It appears that women, yet again, are likely to be left behind. But why would a company like Telefónica want to know just what little old us think of our future anyway? Take that to be altruistic, after all Telefónica has its own start-up accelerator and is working with the EU to create a young entrepreneurial community of 300,000 people, along with many other worthwhile initiatives. Or look at it with a keen eye. We are a huge target market for advertisers and will continue to be so into our later years – more than 90m of Telefonica’s 316m customers worldwide is a Millennial. Companies like this need our custom, our data and actually depend on our success. But given how events have unfolded around PRISM and GCHQ, I’m just surprised they didn’t have access to all of our vital statistics already! My favourite stat from the report was that 89 per cent of everyone surveyed believes that the best days of their country are yet to come. In a world of economic uncertainty where we fumble from one political problem to the next, I’d like to hope that they’re right! This entry was posted in compass, compass youth, generation y, mobile, survey, tech, technology, Telefonica, unemployment, young people, youth unemployment on June 21, 2013 by kirstystyles1. While SMS is still the most widely used messaging service both in the UK and the US, at 96 per cent and 92 per cent respectively, multiple messaging services are now used by 75 per cent of people across both countries. Users of BBM send the largest volume of messages in the UK, an average of 110 per week, according to the survey done by Acision. SMS is second highest, at 75 message per week, Whatsapp at 74, with iMessage and Facebook Messenger on 64 per week. Young adults in the UK, not surprisingly, send 22 per cent more than any other age group – 225 every week. SMS still rules in the US however, with 111 messages sent on this channel every week. Young people aged 12 to 18 send 150 texts on average every week here. Most people message more than 24 people on average across all these platforms, with many seeing SMS as more appropriate for work and OTT for friends. Women also send more SMSs than men. Many of the 1,000 people asked in the US and UK say they prefer OTT because these apps have richer features, like confirmed deliver, speed and cost, which was particularly important in the UK. On the launch of the results, Glen Murray, SVP and GM of Acision in Europe and Russia, took these results as another warning to mobile operators to up their game. “Operators have to be able to monetise five or six different things to compete today,” he said. The research, perhaps necessarily, did not look at all of the OTT apps used in both countries, which have evolved to services like Snapchat, Skype and MessageMe. This entry was posted in apps, messaging, Mobile Marketing Magazine, sms, survey, UK, US, young people on June 19, 2013 by kirstystyles1. Given the number of announcements about mPOS solutions this year alone, you’d be forgiven for thinking that every market trader or corner shop owner is just a tap away from taking card payments on their phone. But the majority of some 4.8m small companies in the UK are yet to accept any kind of card payments, let alone mobile-enabled ones. According to a survey by Intuit of 1,000 micro-businesses, which have fewer than 10 employees, only 19 per cent currently accept card payments. But, while merchants are still getting their act together, many consumers are increasingly cashless. A study of British shoppers by Santander UK and iZettle revealed that 39 per cent avoid businesses that don’t accept card payments or require a minimum payment amount. Independent retailers, pubs and bars, market stalls, taxis, along with food and drink stands at events were all identified as potential losers. Here, we take a look at a range of newly launched and more established mPOS providers to reveal just how competitive the market now is. An industry-standard charge of 2.75 per cent per transaction seems to have been reached to make the offer simple for merchants. Free Apple and iOS app systems dominate, but what does this mean for emerging markets where smartphones haven’t taken hold? Many of the solutions don’t have a large customer base, with some reluctant to reveal their figures. Plus, some of the mPOS supporters detailed below reveal a tech proxy war in the payments space between more familiar companies, and even between different innovation hubs around the world. But what if this doesn’t even take off? Will mPOS be superseded by contactless or peer-to-business payments before you can say swipe or sign? Intuit launched in the UK in March and is the only one of our mobile payments systems currently operating in both the US and UK, as well as Canada. It offers swipe across the pond or Chip & PIN systems to UK traders, which connect via Bluetooth to an iOS or Android app. Established in 1983, giving it a fair head start, the company also offers a range of online book-keeping services to its clients. It was recently caught out lobbying the US government to the tune of $11.5m – more than Apple or Amazon – to ensure its tax solutions don’t get wiped out by free online accounting. Sweden’s iZettle got off to a bumpy start when it launched in November 2012. Although it had a sales partnership with EE in the UK, the free headphone jack-connected swipe device left users unable to accept Visa payments. Nonetheless, the company says it had 100,000 customers by the end of the year. The Chip & PIN reader, which works via Bluetooth and an Android or iOS app, launched in February. It currently operates in the UK, Spain, Germany, Sweden, Denmark, Norway, Finland and now Mexico. Judo launched in the UK in May and operates here on the USP that sellers and merchants do not need a smartphone or a card reader to make or accept a mobile payment. It has 2,000 small business customers at present and says it will go global if its clients require it. There are a range of transaction limits outlined by the company, but these can be waived under certain circumstances. Jusp (short for Just Pay) just received $6m (£3.9m) in Series A funding to develop its European Chip & PIN solution that connects via the headphone jack a la Square. The Italian company was founded by two 25-year-olds in November 2011 and is heading for a Q3 2013 launch. It offers the lowest transaction fee of any solution out there – but only just! The UK’s Monitise launched its mPOS white-labelling service in Europe, Canada and parts of Asia in May this year. The company has a variety of live models that are chosen by its customers and the cost of each deployment depends on a variety of factors, not least of which is the size of market and type of solution. Monitise recently partnered with Blackberry to launch the BBM Money peer-to-peer payment service in Indonesia. O2 is currently offering a Monitise mPOS for £20 (plus VAT and 2.75 per cent per transaction) to Android and BlackBerry users. payleven is on offer in Brazil, a fast-growth smartphone market, along with the UK, Germany, the Netherlands, Italy and Poland. It would not disclose its usage figures, but went on sale in February 2013 with its Chip & PIN device that works via Bluetooth with an Android or iOS app. The German company launched in March last year and like Square in the US, has received the stamp of approval from Apple in the UK, where it is now on sale in retail stores. Although it will not disclose any usage figures, PayPal is among the legacy figures in this line up, and has accumulated 110m active online payments accounts since it launched in 1998. The free swipe/manual/Chip & PIN headphone jack reader and app system, PayPal Here, is ‘on its way’ to the UK this summer. It is already in use in the US, Canada, Australia, Japan and Hong Kong. The company has been accused in recent times of being slow and bureaucratic but it does have the most visibility among consumers. Square was founded by Twitter’s Jack Dorsey in 2009 and was first-to-market with its headphone jack and app solution, which launched first in the US. It is now on offer in Canada and Japan but they haven’t (yet) reconfigured the payments platform for use in the EU. Square currently has 4m users and has a variety of loyalty offers, including the Square Wallet and gift cards. Square recently announced that it would not allow its product to be used by gun sellers. Which is nice. Both Square and PayPal are going head-to-head with operator NTT Docomo in Japan. SumUp is currently on offer in the most countries around the world: the UK, Belgium, France, Portugal, Russia, Ireland, Germany, Austria, Italy, Spain and the Netherlands. It would not comment on usage figures but launched in August 2012, giving it a fair head start over other European providers. It is currently only a chip and signature solution that attaches to the headphone jack, but a PIN reader is on the way. This entry was posted in apps, izettle, jusp, mobile, Mobile Marketing Magazine, mobile money, mobile payments, monitise, mPOS, payleven, Paypal, square, sumup on June 17, 2013 by kirstystyles1. After its mobile traffic overtook desktop for the first time back in April, JustGiving has made it even easier for smartphone and tablet users to make donations to their favourite causes. 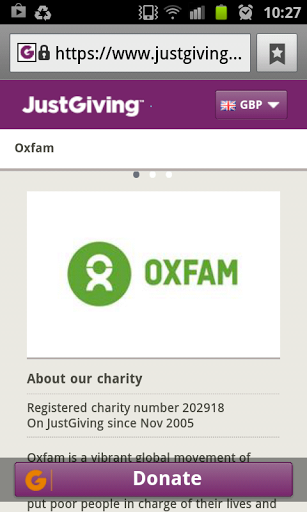 The JustGiving mobile website has been updated so it remembers donors’ credit or debit card details after their first donation. It is hoped that this ‘one-touch’ process will encourage repeat giving. The additional Gift Aid option has also been simplified to ensure more UK tax payers opt in. JustGiving anticipates that by 2014, around 70 per cent of all traffic will come from mobile devices. Its Android and iOS apps will be brought in line with this at a later date, the organisation said. This entry was posted in charity, fundraising, giving, justgiving, Mobile Marketing Magazine, tech on June 14, 2013 by kirstystyles1. Job Centre: With all eyes on Tech City, where are the mobile job opportunities and do we have the skills to fill them? According to the Connected Digital Economy Catapult, established by the Government’s Technology Strategy Board, the IT, software and digital content sectors are worth £100bn to the UK economy. This is larger per head than any other country in the world and could represent 10 per cent of UK GDP by 2015. Speaking at the World Economic Forum in January, EU commissioner for technology, Neelie Kroes, said that Europe would have 1m new tech jobs by 2016 and 2m by 2020, with up to a fifth of these in the UK. Worryingly though, IBM’s 2012 Tech Trends report found that just 1 in 10 UK organisations believes it has the skills to use advanced technologies, including mobile computing, cloud computing, and social business. Meanwhile, 73 per cent of educators and students said there is a major or moderate gap in their institution’s ability to meet demand for these skills. PM David Cameron has announced a £50m regeneration of East London’s Old Street tech hub, Silicon Roundabout, which is due for completion in 2016. While this will certainly create an impressive landmark to showcase digital leadership, little commitment has been made to creating a suitably skilled British workforce. And in any event, it may already be too late. With some of the biggest media companies in the world – the likes of Skype, Amazon, Google, Facebook, and BSkyB – all expanding their mobile operations in London, and each requiring large engineering teams of hundreds of people, the competition is already fierce for mobile talent. Is the UK up to the job? So if it’s skilled digital workers we lack, why do we have an abundance of idle ‘digital natives’, 1m young people who commentators fear becoming a ‘lost generation’ excluded from employment into adult life? While 16-24-year-olds are never too far from Blackberry Messenger or Facebook, many, it appears, may not understand the opportunities in emerging technologies; the opportunity to become creators, rather than simply consumers. If you were born in the 1990s, the digital natives rather than older digital immigrants, can you help but take technology for granted? So far, £6m was pledged in the Autumn Statement to train 3,000 people in technology roles and after intense pressure from the industry, Michael Gove’s controversial EBacc qualification – the education secretary’s proposed GCSE replacement – will now contain computer science as a fourth science option. Business and universities will be consulted in the development of the syllabus, Gove has said. This entry was posted in Boyd Meyers, David Cameron, EU, fintech, Gove, jobs, Kroes, mobile, Mobile Marketing Magazine, parker, schukai, startups, tech, technology, Van der Kleij, Wayra, youth unemployment on June 10, 2013 by kirstystyles1. The Guardian has come out on top in an analysis of the mobile-readiness of the UK’s biggest national newspapers. While all of the publications analysed have an iPad, iPhone and Android app, the Daily Mail, Daily Express and the Times all lack a mobile website – meaning they all scored less than 50 per cent. The Guardian, which has made a public commitment to being a digital first news outlet, was praised for ‘impressively fast browsing’, easy navigation and its new mobile citizen journalism campaign, GuardianWitness. The Independent and its concise sister paper, the i, came in joint second. The assessment criteria, which also included having an option to visit the desktop and having a unified look and feel across different products, were based on the results of a OnePoll consumer survey into expectations of mobile news. Despite its lack of a mobile site, the Daily Mail’s online platform, MailOnline, is the world’s biggest newspaper website – with a whopping 126m monthly unique users across the globe in January, according to ABC. At this time, the Guardian reached 77.9m, but its ease of use on mobile hasn’t translated into profit. The Guardian had a pre-tax loss of £75.6m in the year to April 2012. Bottom of the pile, The Times , likewise saw a pre-tax loss of £21.4m in the year to July 2012. Percentage score out of 410 different metrics across mobile web and apps. This entry was posted in Daily Mail, guardian, media, Mobile Marketing Magazine, mobile website, newspapers, publishing on June 6, 2013 by kirstystyles1.